I posted this image on Instagram and it had such a lovely response, probably because right now, it’s pretty cold with snow and sub zero temperatures forecast as happening imminently. And no matter how positive I am about January - the reality is, it is still January - and Spring and warmth feels very far away. This hot pot was made for an Autumnal Walk feature I did for The Simple Things magazine in their Nov 2017 issue, if you follow the link you’ll also find the recipe for the Mustardy Greens side dish to go with it! I’ve posted the recipe below if you fancy making it this weekend. 1 Tip the flour into a bowl, and season with a few pinches of sea salt and a good grinding of black pepper. Add the lamb and toss to coat in the flour. Heat half the oil in a large ovenproof casserole dish and add the lamb (you may need to do this in two batches). Cook for 5–6 mins, until brown all over, then transfer to a plate with a slotted spoon and set aside. 2 Add the remaining oil to the same casserole dish and gently fry the onions for around 5 mins, until translucent. Add the garlic cloves and cook for a further minute before adding the shallots and carrots. Cook, stirring, for a further 2–3 mins. 3 Return the lamb to the casserole dish, and add the mustard and chopped rosemary. Season and stir well, before stirring through the stock. 4 Preheat oven to 180C/Fan 160C/ 350F. 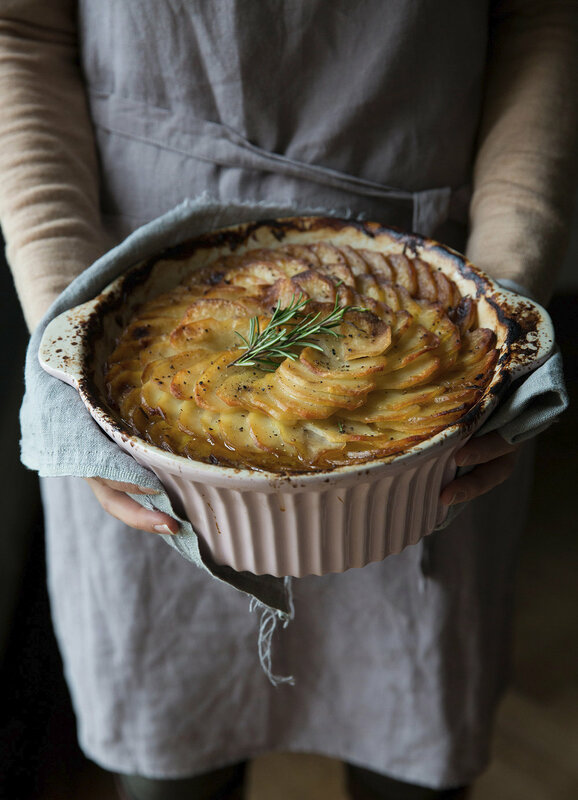 Arrange the potato slices on top of the lamb, overlapping slightly to create a lid for the hotpot. Brush with the melted butter, season with salt and black pepper, and cover with a lid or foil. Bake for 11⁄2 hours. 5 Remove the lid or foil, turn up the oven to 200C/Fan 180C/400F, and cook for a further 30–40 mins, or until the potatoes are golden brown. Garnish with rosemary sprigs.